Writers, players and developers alike wax lyrical about Half-Life and Half-Life 2's abilities to weave a convincing story. But in every single dialogue scene, people are talking straight into Gordon Freeman's face about how the world is going to end or the resistance is under threat, or how their father has been murdered just now, right in front of their eyes, and Gordon is staring straight back at them. Completely mute. Totally emotionless. With dead, unmoving eyes. In every. Single. Dialogue scene. I don't think it's contrarian or facetious to say that when one character is crying over the corpse of her father and the other, ostensibly her best friend and possible love interest, is standing ramrod still next to her not saying a single word – and he hasn't said a single word, ever – I find it hard to be convinced by the power of Half-Life's story. 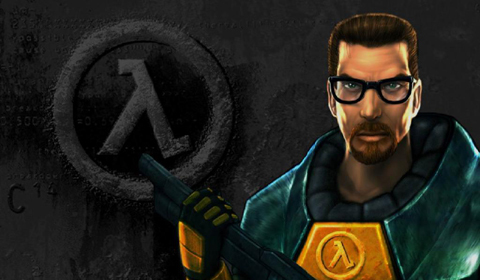 Gordon Freeman has the opposite effect on me: his silence rips me right out of every moment in Half-Life. He is not a conduit – he is abjectly disconnected from his own world. The fact that he consistently tops polls about the best videogame characters ever is indicative of just how lame characters are in videogames, in what dire straits videogame writing generally is in and how videogame players would rather games stroke their egos and tell them it's all about what THEY feel and what THEY want, than be told challenging stories with credible characters. In short: Gordon Freeman is the pits. As for the original Half-Life, its various sights and sounds are instantly evocative. The blood splashes and “gibbing” animations which emanate from dead bodies, should you repeatedly bash them with the crowbar. The suckling sound of the Barnacle. The automated announcements over Black Mesa's PA system. Even that discouraging bloop sound when you press Use in front of something which cannot be used. I have spent hours not just playing Half-Life, but watching it being played, gazing at its screenshots, listening to its sound effects. And I'm not alone. This is a YouTube channel devoted to Half-Life minutiae. Without comment or analysis, the videos merely observe small happenings and behaviour amongst Black Mesa and its inhabitants. I've said this before about Goldeneye on the N64: I don't know what it is, but the sound, colour and assets palette of Half-Life, for some reason, appeals to my senses. My ears and ears just like it. And it's a fine shooter. Instead of constantly blasting enemies, Half-Life makes fun out of crawling in vents and treading carefully over ledges and ladders – at its best, it feels like the earlier scenes in Die Hard, as you tangentially move around Black Mesa trying to avoid both enemies and the dangerous, destroyed environment. But the narrative keeps moving further and further away. To begin with, it's simple: get out of Black Mesa. And then the soldiers turn up. And then you've to get to the Lambda Complex. And then you're on Xen. A simple, solid set-up quickly devolves into gaseous, save-the-world nonsense. Half-Life 2: Episode Two is Valve's strongest piece of writing. It's because, overarching plot wise, all the player has to do is get from A to B. Everything else is stitched in along the way. All this to say, instead of smart or graceful, Half-Life is often pretentious. The second one especially hates itself for being a shooter and does everything it can to avoid what it perceives as base clichés. DOOM is better. You're not wrong. It really is, on the face of it, a bizarre storytelling method. I can definitely understand on an intellectual level why someone would find it jarring. On the other hand, this was not my experience at all. I've often had many problems with protagonist characters making decisions or saying things that I would not, despite the fact that I was supposed to be playing them. The blank slate of Gordon Freeman felt, and still feels, really freeing for me on some emotional level that I can't quite explain. The character (as little as he exists), feels the closest to any semblance of me, the actual me, being in the game. I didn't have a problem with Gordon's silence in Half-Life, but I think it's the shift to Half-Life 2 that makes it stand out the way Ed describes. Half-Life is highly abstracted. There's some efforts to ground everything in realism, but that only flies with the typical overblown shooters of the nineties as a reference point. Gordon's silence doesn't really have any sort of backdrop to clash with. Half-Life 2 no longer limits the supporting cast to four randomised scientists and one ubiquitous security guard, but introduces bespoke characters (Alyx, Eli, Kleiner, Barney) and injects the story with a lot of human drama. Gordon still standing around like a waxwork doesn't work at all there, especially since the dialogue jokingly calls attention to it as well ("A man of few words, aren't you" and "Let me do the talking, Gordon"). I've talked more about that here (in response to an article from Ed, because of course). I definitely agree that it stands out more in Half-Life 2, due to the sequel's increased emphasis on realism. At the same time, I don't think it bothers me as much as it might other people. Our difference of opinion on this is mostly to do with severity, but that's probably don't to subjective likes and dislikes, etc. It does make me wonder what Valve are going to do about it, in the next instalment. Will they have Gordon finally talk? Or will they do something involving facial and/or voice recognition (via your webcam) to let you smile, frown, or even actually talk to the game, and have characters respond appropriately? That seems vaguely in line with what they've been exploring in recent years.